In need of parts? Come down and talk to Gilgandra Toyota today about the great offers we have in stock for you! Our Parts Department pride themselves on customer service, which is integral to our business operating smoothly as a whole. In doing this we are ensuring consistency right across the board, all while assisting you with your parts and accessory needs. We carry a large range of products so that we are able to meet demands and decreased waiting times. All of our Parts Interpreters are experienced and continually trained to Toyota standards enabling us to advise customers on best suited parts & accessories. Our customers are important no matter what their business is with us on any given day. Genuine parts have been used to build your car or motorcycle. Genuine parts are made or selected by the vehicle’s maker and rigorously tested by that maker as an integral component of the vehicle to meet high quality, safety and performance standards. This ensures that your vehicle will drive, function and protect you the way it was intended. If your vehicle needs replacement parts following a collision or during servicing and maintenance, it’s essential that genuine parts are fitted. Genuine parts are new and the only parts approved and warranted by the vehicle’s maker and you can only guarantee you will get genuine parts by sourcing them through the vehicle maker’s authorised supply chain — use anything else and you may be taking a risk! All Toyota Genuine Parts are made to the same exacting standards as our vehicles, and are designed specifically for each model. Which means each part will fit perfectly and meet the high quality standards of your Toyota. For extra peace of mind on their quality and reliability, our Toyota parts carry a 12 month Toyota warranty. WARNING: Non-genuine parts can affect your ability to claim under the Toyota Warranty. It is important to note that if a non-genuine part is fitted to your Toyota and that part's failure or the incorrect fitment damages your vehicle, then that damage may not be covered by your Toyota Warranty. Get in touch with Gilgandra Toyota to order in your new Toyota Genuine Parts today. Why not give your car a personality of its own? Here at Gilgandra Toyota we have a wide range of Toyota Genuine Accessories for all Toyota makes and models tailor-made to complement each vehicle's unique styling and performance whilst meeting all relevant regulations. 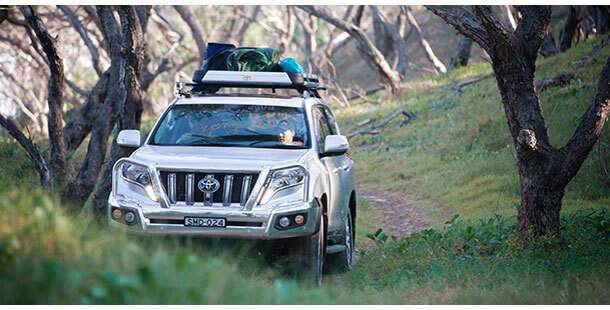 Toyota Genuine Accessories are designed, tested and manufactured to strict Toyota standards. This quality and reliability is supported by our Toyota Genuine Accessories Warranty.